The global tilt is nothing less than an irreversible shift of economic power—jobs, wealth and market opportunities—from a small part of the world to its entirety. It is improving the lives of millions of people around the world, and while it is creating immense opportunities, it is disrupting the world as you know it with dizzying speed. If you’re an American or European, any assumptions you may have about national and managerial superiority are obsolete. Businesses in China, Singapore, India, Brazil, Malaysia and other countries on the move have ready access to the capital and expertise they need to grow. Their leaders have just as much knowledge, talent and drive as you do. And they are unleashing their entrepreneurial verve to scale up fast and grab once-in-a-lifetime opportunities. These businesses will soon be competing with yours everywhere on the planet, even if you’re not aware of them yet. Finding opportunities of your own requires you to consider vastly different perspectives and to see the new global landscape in its entirety and then change the content of your work to pursue them. Those who can pursue the opportunities in a tilted world have a remarkably bright future. 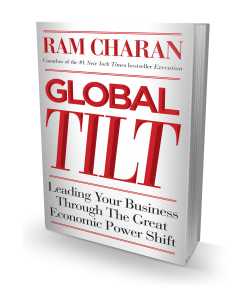 Ram Charan’s unparalleled experience with global leaders and companies and the unique and powerful insights he brings to this book will light the way for you and your exciting journey. 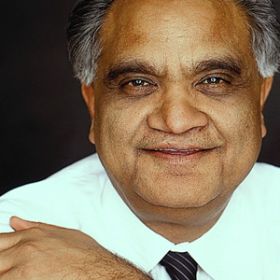 Ram Charan is a world-renowned business advisor, author and speaker who has spent the past 35 years working with many top companies, CEOs and boards of our time. In his work with companies including GE, MeadWestvaco, Bank of America, DuPont, Novartis, EMC, 3M, Verizon, Aditya Birla Group, Tata Group, GMR, Max Group, Yildiz Holdings and Grupo RBS, he is known for cutting through the complexity of running a business in today’s fast changing environment to uncover the core business problem. His real-world solutions, shared with millions through his books and articles in top business publications, have been praised for being practical, relevant and highly actionable—the kind of advice you can use Monday morning. Ram was elected a Distinguished Fellow of the National Academy of Human Resources and has served on the Blue Ribbon Commission on Corporate Governance. He has served on the boards of Hindalco in India, Emaar, Austin Industries, Tyco Electronics and Fischer and Porter.